Steve, a volunteer firefighter since 1982, has a special partner by his side and she comes with four paws and a wet nose. Hard of hearing since he was 3 years old as the result of spinal meningitis, Steve had a difficult time living independently without relying on the assistance of other people. Now, with Hearing Dog Luna V by his side, Steve can relax knowing she always has his back. Hearing dogs like Luna help people who are deaf or hard of hearing navigate a sometimes silent world. They alert their handlers to many everyday sounds like the doorbell, telephone, oven timer, dryer, fire alarm and more. 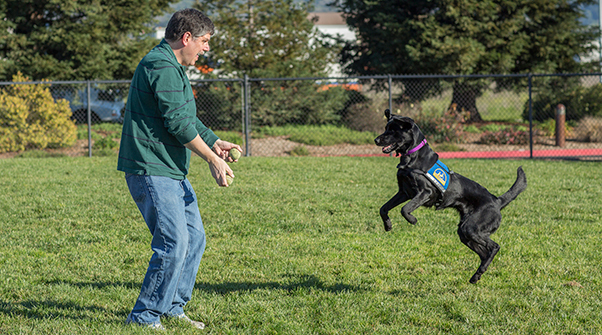 Luna has helped Steve gain independence and overcome everyday obstacles since they became a team. “One day I was cooking and forgot about the food on the stove. The food was boiling over, but Luna figured something was up with the noise and smoke. She alerted me to this and kept me from starting a stove fire.” Luna goes almost everywhere with him; Steve and Luna now take on the world together. 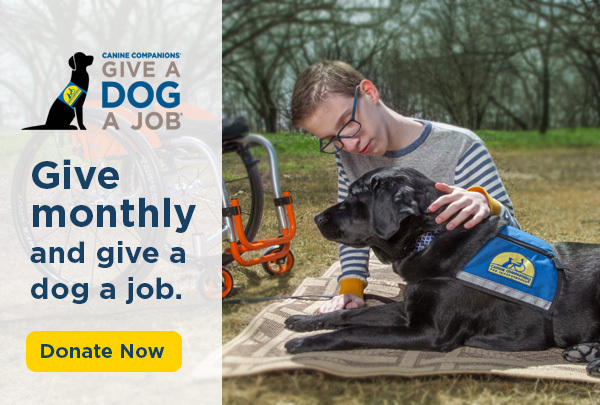 Help provide more dogs like Luna to people like Steve when you Give Independence - and Give a Dog a Job®. The adventure continues for Canine Companions dog Kinkeade, who is in professional training to become an assistance dog! He’ll know up to 40 commands by the time he graduates. Get a behind-the-scenes look at his training and all the commands he's working hard to master. What’s cuter than these puppies in wagons? A whole calendar full of adorable puppy photos! Pre-order your 2018 Canine Companions puppy calendars for October delivery. Enjoy adorable puppies 365 days a year with a $25 donation, shipping and handling included. Get your calendar now. Pick your free notebook with a credit card purchase of $40 or more in the official Canine Companions online gift shop. Limit one per order. Use promo code 1129 for lab puppy, 1127 for black fluffy pup and 1128 for golden and lab puppies. Offer expires 9/30/17. Raise a Puppy, Change a Life. Volunteer puppy raisers needed! Grab a leash and join the fun at DogFest Walk 'n Roll.